QMy sister and I are caring for some orphan field mice, and one of them, we think, has a severe case of bloating. We found the mice when they were around 2 days old and they are now a week old. We are at the present feeding the mice on a diet of evaporated milk because they would not take to the kitten milk replacer, and they seem to be doing fine on that. If you would be so kind as to take a look at the pictures I’ve attached and tell us if you think it is bloating, and how we can remedy it. Could you also give us any information as to whether we should change their diet from the evaporated milk, or should we be adding anything to it yet? AI’ve never used evaporated milk so don’t know how orphan rodents do on this type. Mice raised from their mothers get 12–13% fat, 9% protein, and 2–3% lactose. Yes, it does look bloated in the photo. 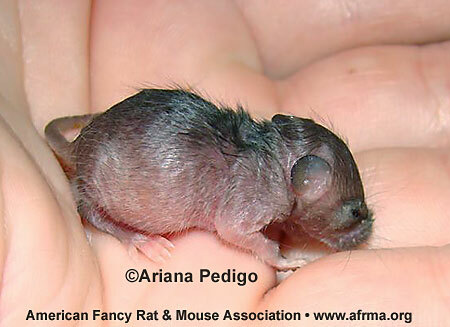 In the question Amount to Hand Feed Orphan Baby Rats , answer by Margaret F. Smith, she says overfeeding can cause bloat. It can also be from gas in the belly, the formula being too concentrated, or feeding too quickly. There are several videos on YouTube by Aud Fischer of Creek Valley Critters in Canada—one on bloat from not being fed often enough and not enough water in the formula and what she did for the problem. She also has a homemade formula using goat milk. If they are doing well otherwise and growing, changing the formula may not be necessary. You won’t need to add any solid foods until the eyes open in a few days and then there are several things you can add (see the article Caring for Rat & Mouse Orphans ). We have had a couple questions on orphan mice on our Facebook page that you can read to see what they went through with their little ones—from Kimberly Martin DeVolld who raised a couple field mice 10-13-11, 10-15-11, 12-30-11; and from Esha Vogel on raising a domestic mouse 5-3-12, 5-9-12, 6-2-12, 6-30-12. Let us know how they do. Update: The three mice are officially weaned onto bread and milk now and are doing perfectly fine. The bloated mouse is completely cured. We gave him some Pedialyte and some extra tummy rubs and he is fine. You can add to your website that evaporated milk does work on baby mice. I fed it to them on a paintbrush and it seems to work rather well. Thank you so much, your advice helped so much. Sorry it took awhile to get back with you, I’ve been catching up on some lost sleep.